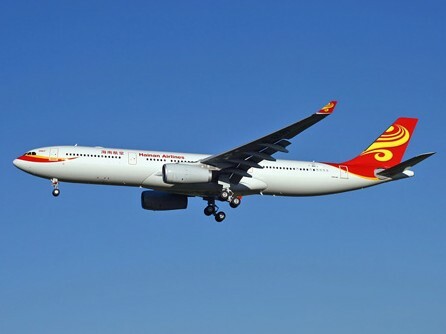 China’s Hainan Airlines will commence direct flights from Sydney to Shenzhen from January 19, 2011. Flights from Sydney will depart every Tuesday, Thursday and Sunday at 10.10am, arriving at Shenzhen at 4.20pm. The service will then continue to Hangzhou for a 7.50pm arrival. Return flights will take place on Monday, Wednesday and Saturday – departing Hangzhou at 3.55pm, departing Shenzhen at 6pm and arriving in Sydney at 7.40am the next day. The thrice-weekly service will run on Hainan’s Airbus A330-200 with 36 business class seats (in a comfortable 2-2-2 configuration) and 186 economy seats (in the more common 2-4-2 layout). The business class seats sport a generous 74 inch pitch – just six inches short of the business class legroom on Qantas’ Airbus A380 – and recline fully flat to 180 degrees, while the cabin’s gallery includes an espresso machine. Hainan is also looking to join one of the three global airline alliances. OneWorld is said to be the most likely choice, as it’s the only alliance without a mainland Chinese partner. Hainan Airlines join Chinese airlines Air China, China Eastern and China Southern – along with Cathay Pacific, Qantas and Virgin Atlantic – in operating flights from Sydney to China. However, it will be the only airline with direct flights to the boomtown of Shenzhen – southern China’s major financial centre and the epicentre of China’s high-tech and manufacturing industries. "The growth in the Chinese market over the last five years has been very strong" observed Sydney Airport CEO Russell Balding. "The year to date figures on flights to China including both Australians outbound and Chinese inbound visitors show exceptional growth at 32% for the first ten months compared to the same period in 2009." Flights between Australia and China are in high demand. For example, in the 44 flights China Southern Airlines took from Australia to China in August, an average of 85% of seats were filled. Air China flew at 81% capacity, while China Eastern and Qantas had around 76%.